Syndeia is a software platform for integrated model-based engineering. It enables engineering teams to collaboratively and concurrently develop and manage the Total System Model (TSM) of a system/product by federating models and data from diverse ecosystems of modeling and simulation tools, enterprise applications, and data repositories, and weaving a digital connected graph. This diverse set of tools and repositories include, for example, SysML modeling tools (e.g. MagicDraw, Rhapsody), PLM systems (e.g. Teamcenter, Windchill), CAD systems (e.g. NX, Creo), ALM systems (e.g. GitHub, JIRA), Project Management Systems (e.g. JIRA), Requirements Management Systems (e.g. 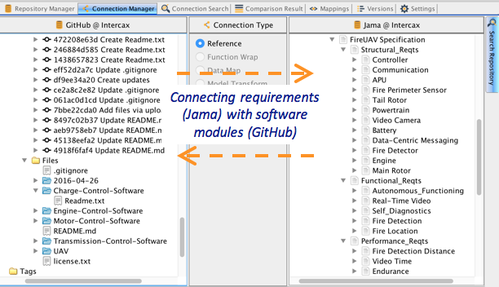 Jama, DOORS-NG), Simulation tools (e.g. Mathematica and MATLAB/Simulink), Databases (e.g. MySQL), and other data sources (e.g. Excel). Syndeia provides a rich set of services for building, managing, analyzing, querying, and visualizing the Total System Model of the product/system through its lifecycle. Syndeia builds on a variety of open standards (e.g. REST/HTTP, JDBC, JSON, STEP, OSLC, and FMI), open source projects and libraries, and production-ready APIs made available by our partners. The Total System Model graph is the digital blueprint of a system that evolves through the lifecycle. It is aware of the versions of connected models in various configuration management systems (e.g. PLM, ALM, Requirements Management). Syndeia provides model transformation services to build the Total System Model graph, such as drag-n-drop requirements from Jama or DOORS-NG to SysML, generate Simulink models and PLM part structures from SysML models, connect behavior elements in SysML to software code in GitHub, or track the development status of a sub-system in JIRA directly from SysML. 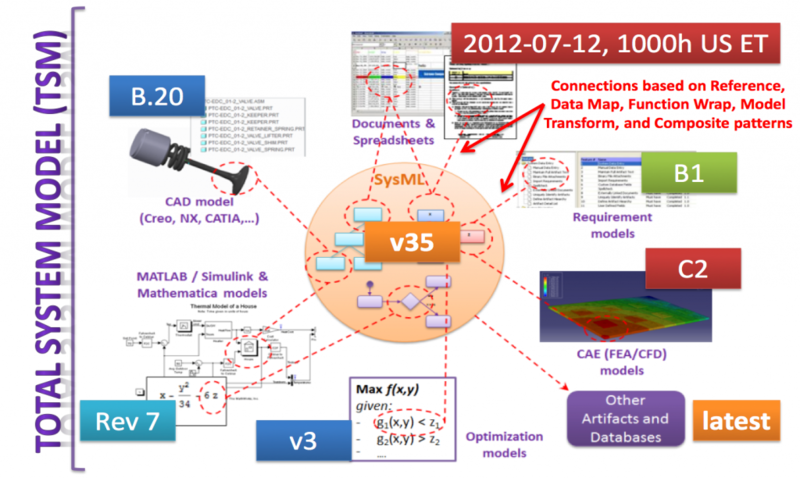 Syndeia provides services to search, compare, and bi-directionally synchronize connected models in the Total System Model graph, such as compare and sync changes in system architecture to PLM part structure, or compare connected SysML and Simulink models, or sync changes in DOORS-NG requirements to SysML. 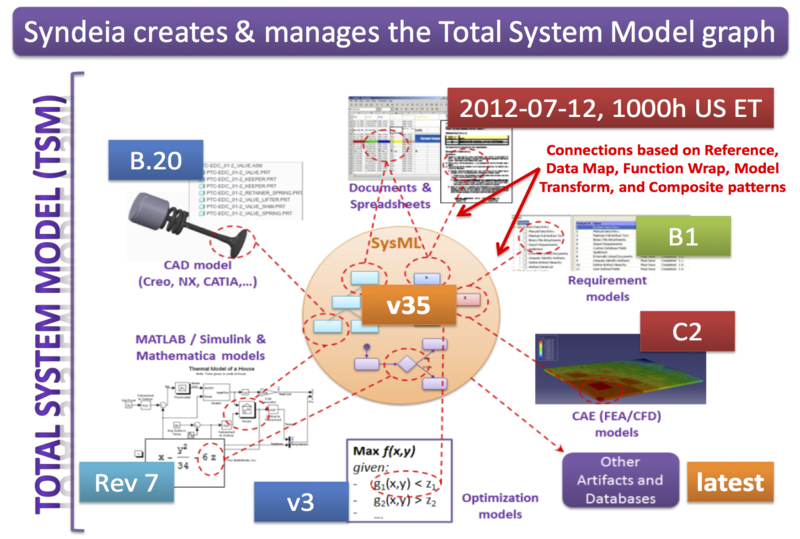 The figure below shows a systems engineering view of the Total System Model graph, focusing on system architecture (in SysML) as the hub. 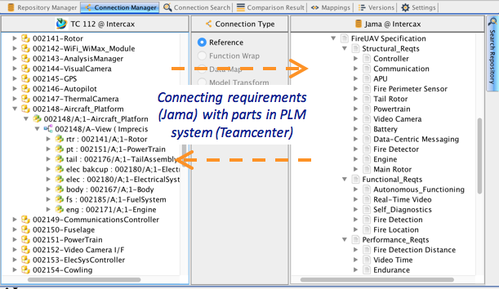 Similarly, a mechanical/electrical engineering view will have the PLM/CAD structure as the hub, and a software engineering view will have software modules (ALM structure) as the hub. In Syndeia, these views are part of the same Total System Model graph. Syndeia 3.2 is the latest release of the Syndeia platform. It brings the following new features. Syndeia 3.2 includes the first release of Syndeia Cloud, a fast and scalable platform for next-generation of model-based engineering. 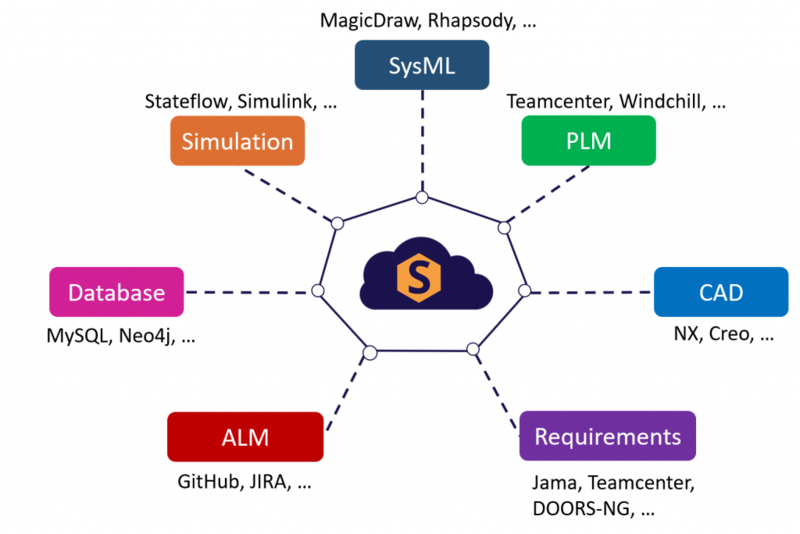 Syndeia Cloud provides services for building, managing, analyzing, querying, and visualizing the Total System Model of a product/system through its lifecycle, federating data from multiple disciplines, data repositories, and tools/ecosystems. Existing Syndeia plugins for SysML modeling tools are now clients of Syndeia Cloud. Users can collaboratively and concurrently develop the Total System Model for a product from multiple Syndeia clients. 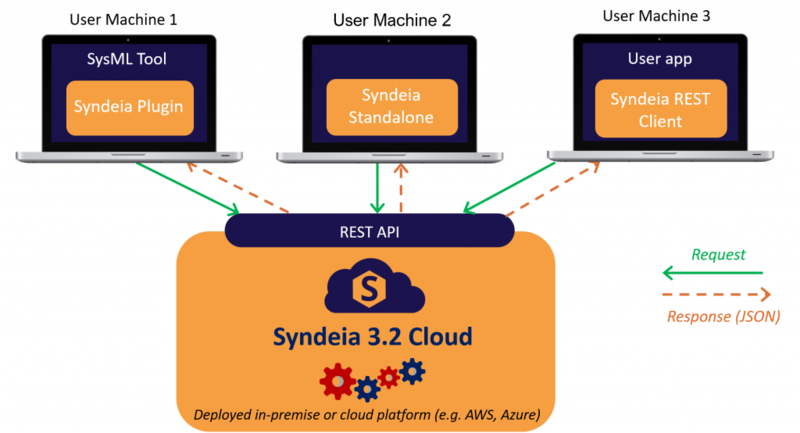 Syndeia Cloud can be deployed on-premise or on cloud platforms, such as AWS or Azure. Users can now create Syndeia projects that can serve as the Total System Model for any product/system, federating and connecting information from multiple related projects originating in different disciplines and tools. Users can concurrently work on the same Syndeia project from different Syndeia clients. 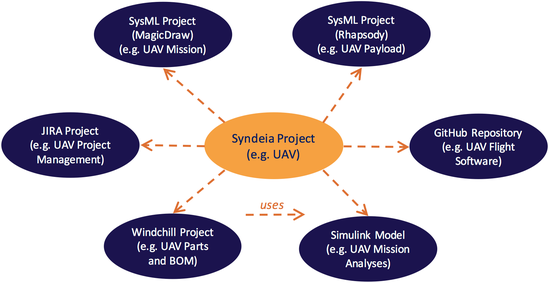 For example, users can define a Syndeia project for an Unmanned Aerial Vehicle (UAV) and can connect multiple SysML models (same or different SysML tool), JIRA projects, Windchill projects, DOORS-NG projects, or GitHub repositories to that same UAV project on Syndeia Cloud. This makes it possible to truly build a federated and integrated Total System Model for the UAV system. 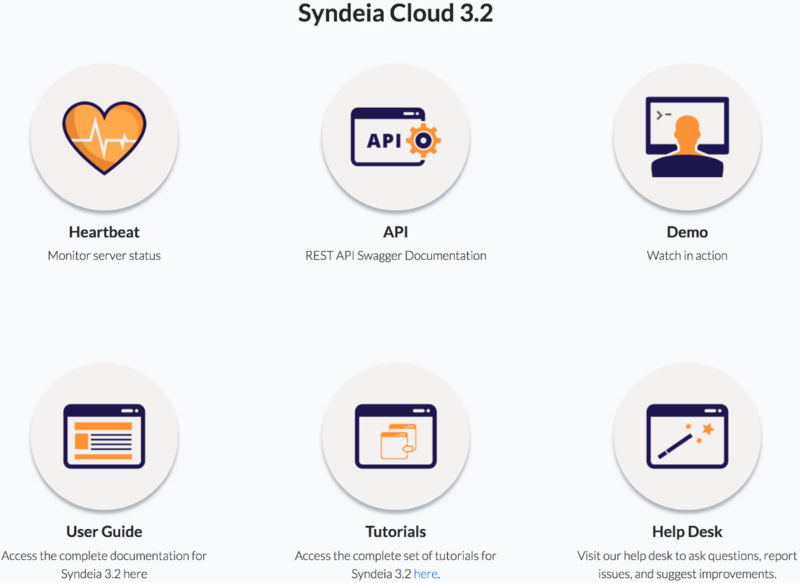 Syndeia projects and their contents can be accessed via Syndeia clients and Syndeia Cloud’s REST API. 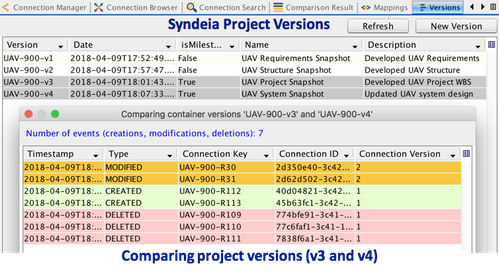 Users can create versions (snapshots) of Syndeia projects, mark them as milestones, and compare versions to view the chronological list of events, such as relations created, modified, and deleted. Syndeia Cloud provides a rich REST-based API that makes it possible to integrate Syndeia in other enterprise environments and develop new user apps. 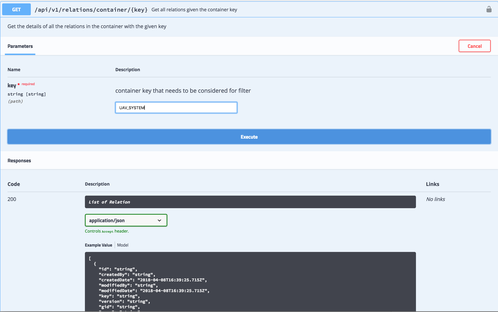 The REST API is published using Swagger, making it possible for developers to try out the API directly from the documentation without writing a single line of code. The same REST API is used by Syndeia clients, e.g. plugins to SysML modeling tools, to interact with Syndeia Cloud. Syndeia 3.2 introduces a Standalone client that makes it possible for non-SysML users to use Syndeia’s capabilities. For example, hardware engineers and software engineers can create relationships between physical design models in multiple PLM/CAD systems, software modules and code in multiple ALM systems, and requirements in multiple requirement management systems at a fine-grained level. All of this data is backed by Syndeia Cloud and available to trace, query, and visualize. Users working with Syndeia Standalone client and SysML plugin clients can work together on the same project on Syndeia Cloud. Syndeia 3.2 brings a powerful capability to define custom mappings between element types in different tools and repositories. 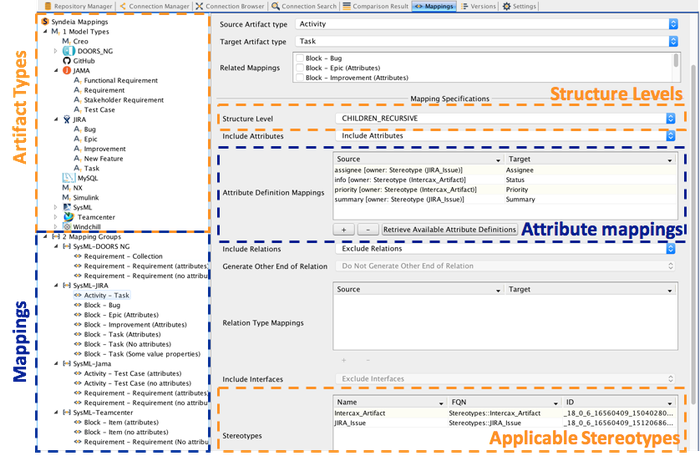 For example, users can create custom mappings between a SysML element type (such as Block, Activity, Use Case, or Requirement) to issue types in JIRA (such as Improvement, Story, or Task), including their attributes. Once defined, users can select specific mappings when generating models, such as drag and drop a SysML activity to create tasks in JIRA, or vice versa. The mapping information is stored with the relationships created between model elements and is used for downstream compare and sync operations. Pre-defined mappings are available as before. With great power, comes great responsibility. It is recommended that mappings are first defined by advanced users and then deployed for and used by other users. Organizations, groups, or individual projects can create standard mappings based on their model-based engineering methodologies and practices. 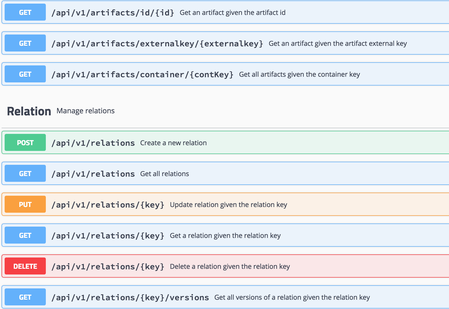 Syndeia provides an easy-to-use interface to register artifact (element) types originating from different repositories and tools and create mappings between those types. Syndeia 3.2 brings new capabilities for Stateflow. Users can now generate state behaviors (entry, do, exit) and transition behaviors (triggers, guards, effects) in Stateflow from SysML state machine models, and vice versa. This is available as an option. Capabilities to compare and sync are available as before. In addition to the new features introduced above, Syndeia 3.2 also brings improvements and fixes to existing capabilities with Simulink, Jama, Teamcenter, Windchill, DOORS-NG, JIRA, GitHub, MySQL, Creo, NX, and Excel.